Wood floors require expansion space at the wall. Moldings are used to cover the expansion area, to hide cut ends, to create height differences, and to accent the floor. Profiles are many and vary through the industry. Here are some examples. 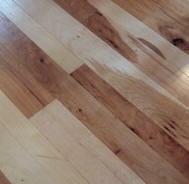 BASE -- from 3/8" to 5/8"thick, from 1 1/2" to 4+" high; used to protect the wall and "picture-frame" the wood floor. SHOE -- from 3/8" to 5/8" thick from 1/2" to 1" high; used on vertical face bases to complete expansion cover - age; flexible enough to conform to irregular surfaces. QUARTER ROUND -- one quarter of a full round; from 1/2" to 1"; used as shoe in some areas. REDUCER -- from 3/8" to 3/4" thick, 1" to 2 1/2" wide; used to make transition in thickness from wood floor down to thinner or thicker surface (hard tile or carpet), generally at door openings. RISER -- 3/4" thick, various widths, used to create the verticle "rise" in the step. TREAD -- 1" to 1-1/16" thick, 8" to 12" wide, the actual step surface. NOSE (Nosing) -- also called stair nose, bull nose, stairwell trim, landing tread. 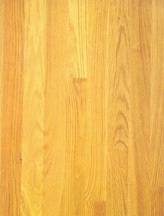 Thickness is same as flooring( 3/4" or floor material is sometimes used). These are used to create finished edges on the top step, around stairwell, sunken living room, etc. Finished moldings should match your floor or be painted to match other nearby trims. The detail of using the correct moldings makes for a good installation, and speaks well of the installer. Make sure these details are addressed before or during the installation.